Acupressure, aromatherapy, Ayurveda, flower therapy, nutrition, herbalism, homeopathy, hydrotherapy, imagery, juice therapy, massage, reflexology, relaxation and meditation, sound therapy, and yoga oh my! Specific health problems are discussed from each of these perspectives; home remedies are presented and suggestions for when to seek professional help are highlighted. 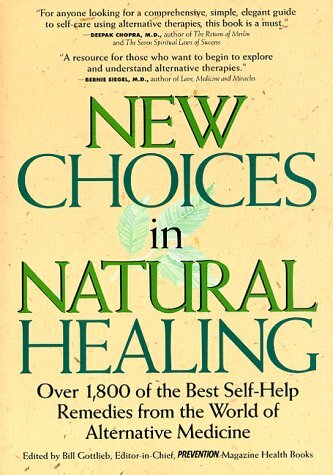 "New Choices in Natural Healing is an excellent take-home reference on alternative medicine. My patients are constantly asking me to recommend a book just like this one so that they can incorporate alternative techniques into their day-to-day care." "By size and scope alone, this is a significant new resource in the field of alternative medicine." "This volume offers a clear, concise introduction to a wide range of complementary healing practices from around the world." "This impressive display of research and advice is a smorgasbord of natural-healing techniques for a wide variety of health problems. It makes a great home health resource." 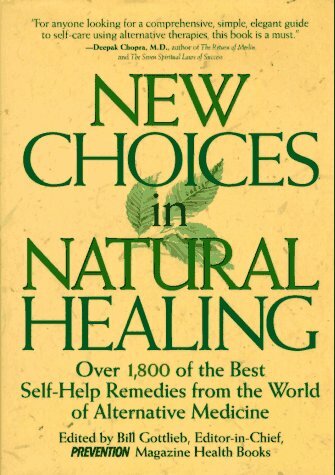 "New Choices in Natural Healing is designed to help separate the safe and time-proven (therapies) from the dangerous and useless."